The Bureau of Meteorology has officially declared that we are in an El Niño, shifting its tracker from ALERT (a greater than 70% chance of El Niño forming) to an actual event. Speculation began in early 2014 that the world would see an El Niño, possibly a significant “super” event, by the end of that year. 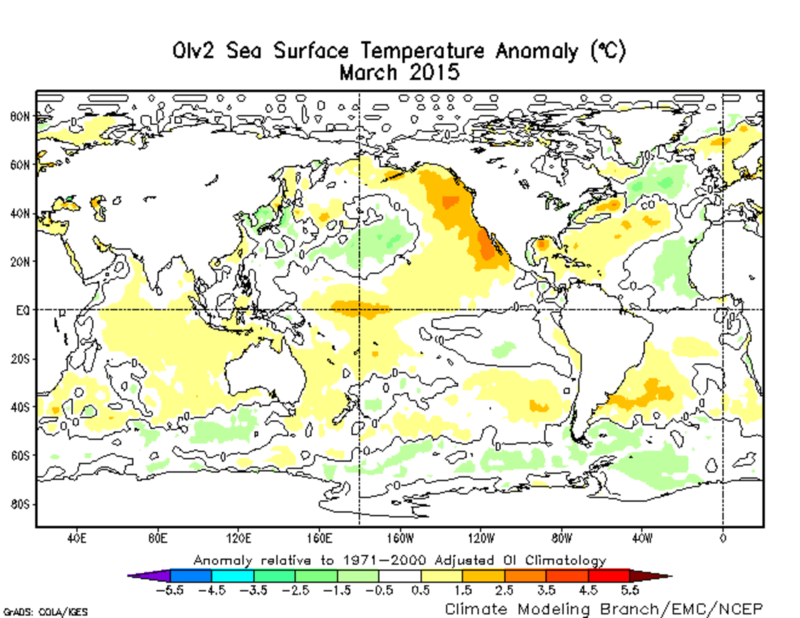 However the event development hit a few setbacks, and many thought the El Niño was already dead. In March this year, US National Oceanic and Atmospheric Administration officially declared that the “most-watched” 2014-15 El Niño had finally arrived. Now our own Bureau has followed suit. So what’s going on? And how severe could the 2015-16 El Niño turn out to be? El Niño usually develops over the southern autumn-winter, peaks around Christmas, and decays in the southern autumn. So this event is unusual as an El Niño would generally be decaying by this time of the year, but observations over recent weeks show otherwise. Sea surface temperatures in the El Niño core region (eastern equatorial Pacific) are actually still warming and the pattern is now looking more like a classic El Niño. …and more recently. 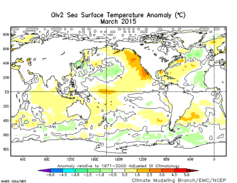 Warming over the eastern Pacific is more similar to El Niño conditions. In fact, the warm anomaly over the eastern equatorial Pacific – the typical indicator for an El Niño – has in the past three weeks exceeded 1C. Assuming this El Niño peaks at Christmas of 2015, this recent 1C temperature anomaly is unprecedented during the autumn of all developing El Niño years since at least the early 80s. We’ve seen a similar size temperature anomaly in the autumn of 1987, but that was in the middle of two, back-to-back El Niño events: the summers of 1986-87 and 1987-88. At that time ocean heat under the surface was already on the decline following the peak of El Niño on Christmas 1986, while sea surface temperatures received a second boost to peak in August of 1987. This year though it looks like the 2014-15 El Niño is yet to reach its peak. 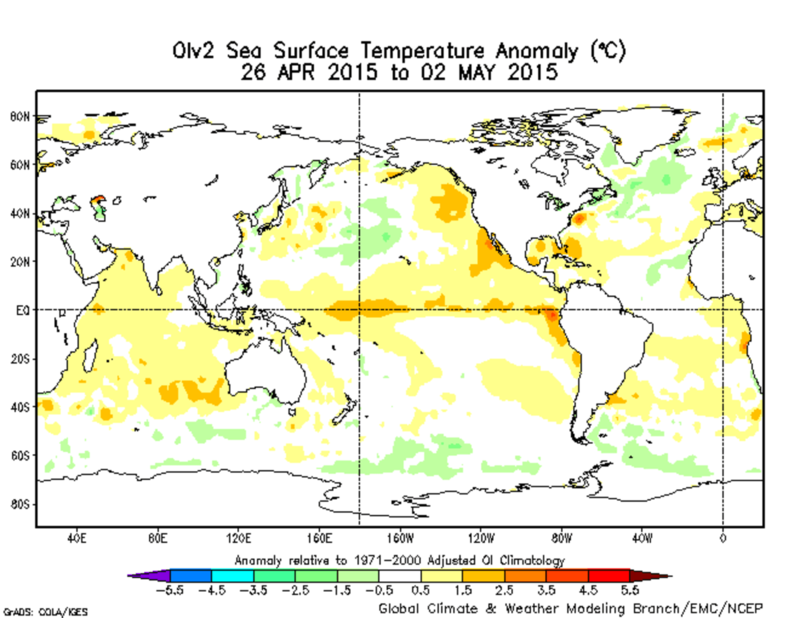 Both the temperature anomaly and amount of ocean subsurface heat are still building. The ocean heat has in fact surpassed last year’s massive value and is now rivalling that during the development of the 1997 super El Niño. 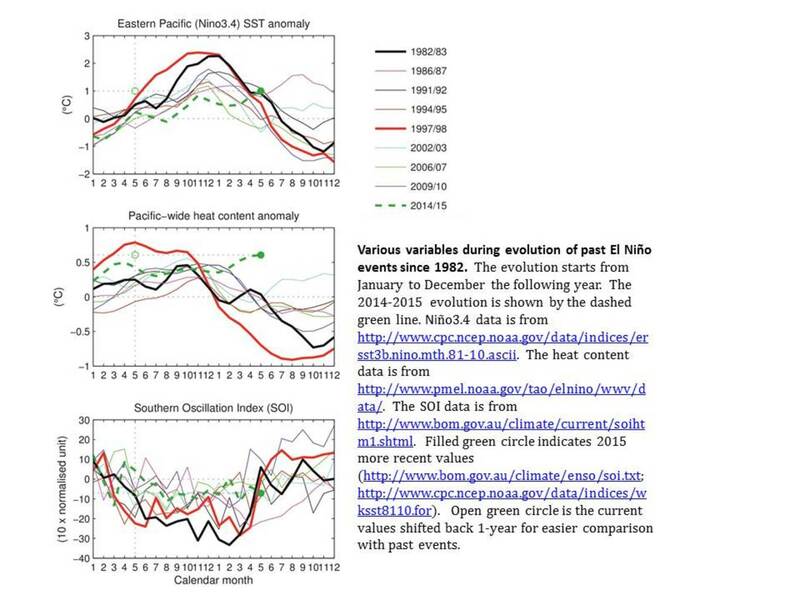 Prospect of a double El Niño (2014/15-2015/16) whose trajectory in some key variables is indicated by the green dashed line. If things continue at this current rate, it will not be surprising if we end up later this year with a fairly strong El Niño, possibly even equalling the magnitude of the 1997-98 extreme event, except that this time it would also be technically a back-to-back El Niño – given 2014-15 is now considered an El Niño year. Since El Niño is often linked to drought here in Australia, particularly in the eastern states, the prospect of a back-to-back El Niño is concerning. This is especially when many parts of the country, particularly Queensland, have been in drought for the past couple of years. The key now is what happens to the atmosphere, which we measure with the Southern Oscillation Index. This indicates that the atmosphere has responded to the sea surface warming. According to BOM, the index has been negative since July 2014. It remains to be seen whether this will continue to track and amplify the underlying eastern Pacific sea surface temperatures. About this time last year when we were also anticipating an El Niño, the index switched to positive, indicating the loss of communication between the ocean and atmosphere, which effectively made it less likely there would be a strong event. Nonetheless, it was the large amount of ocean heat that got experts watching last year. This heat has remained and recently been enhanced, keeping the system El Niño ready. Some forecast models do currently predict a strong event later this year. However it is important to note that presently the actual likelihood of this occurring is relatively small when all models and forecast ensembles are considered. So it is also possible that this El Niño dies off before reaching its normal Christmas peak, like the last double El Niño event of 1986/87-1987/88. Regardless of what pans out in the coming months, it would be wise to prepare for the impacts of an El Niño event. It is always important to remember that El Niños are not the only factor influencing rainfall over eastern Australia. As the continent spans a large latitudinal extent and is sandwiched between desert in the west and oceans elsewhere, our region is rich of atmospheric frontal activities that can result in episodic extreme rainfall events. A clear example of this is the recent East Coast Lows that drenched the south-eastern seaboard with rain and hail a couple of weeks ago. So the severity of the impact tends to vary from event to event. For instance, rainfall decline during the 1997-98 super El Niño was largely isolated in southeastern Australia, while it was intense and widespread during the 1982-83 less super event which was tainted by the tragic Ash Wednesday bushfires. During the 1986-88 back-to-back El Niño, the impact was relatively mild, with drying mostly occurring in Northern Territory and Tasmania. Soil moisture level prior to each event is also one determining factor influencing its severity. An El Niño is not all bad for Australia. There are generally less tropical cyclones impacting the Australian region during an El Niño year. However, as an El Niño event basically acts to redistribute global weather systems, the tropical cyclone formation region shifts away from the Australian coast further out into the Pacific. This however, means that these storm cells are more likely to impact western Pacific Island nations. There is also a similar redistribution process occurring for rainfall, where the west Pacific (and Australian) drying is balanced by rainfall increases on the other side of the Pacific. Drought stricken regions like California, which is currently in the midst of one of their worst droughts on record, may finally get some relief. El Niño also means higher global average air temperatures. Scientists and others have been captivated by the over-hyped “global warming hiatus”, which is more a slowdown in warming following the rapid trends of the 1980-2000 period. A number of factors have been proposed to explain this. 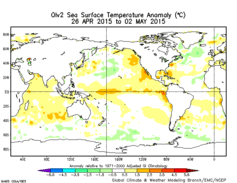 One prominent contender is the negative phase of the Interdecadal Pacific Oscillation (IPO). The IPO is a natural climate mode of variability that resembles El Niño and La Niña in pattern, but one that vacillates over decades rather than years. In the negative phase of the IPO when La Niña events are more prevalent, more heat is soaked up by the ocean. In contrast, positive phases of the IPO release heat that is stored in the ocean. With 2014 having broken the record in global temperatures, an impending El Niño will make it more likely that 2015 will beat 2014 record. This impending El Niño, and the associated back-to-back El Niño events, could mark the switch into a positive IPO that would see global warming accelerate. Agus Santoso is Senior Research Associate at UNSW Australia. Andréa S. Taschetto is Research Associate at UNSW Australia. Matthew England is Australian Research Council Laureate Fellow; Deputy Director of the Climate Change Research Centre (CCRC); Chief Investigator in the ARC Centre of Excellence in Climate System Science at UNSW Australia. Shayne McGregor is Research Fellow at UNSW Australia. Guest Work is the Sciblogs guest blog where we run submissions from a wide range of contributors. Contact Sciblogs about making a submission.